events for attendees to feast into, bringing people together to help shape a knowledge, collectivism and bonding between diverse sections of Brighton’s population. This year’s month-long festival will be holding plenty of interesting, immersive, fun and unusual events as ever, with it all kicking off with the launch party at Phoenix Brighton. The launch of the 2018 Lumen Prize for Digital Art Exhibition will coincide with the launch party as well as the CAS50 (Computer Arts Society) Exhibition, to mark its 50th anniversary. This includes a compelling collection of high-quality computer art works. After Phoenix gets the festival up and kicking, the next month will hold some fascinating installations such as Irene Fubara-Manuel: Dreams of Disguise which takes biometrical technologies and blurs documentary truth and science fiction to reveal the global surveillance of migrants and the violence that can be inherent within this practice. You can also get a chance to explore the UK premiere of Laurie Anderson and Hsin-Chien Huang’s: Chalkroom which will be a focal point in the Brighton Digital Festival. In this celebrated VR work, installed in a temporary space, the viewer can attempt to take a solo flight in a virtual world, whilst moving around an enormous structure made of words, drawings and stories. Max Cooper & Architecture Social Club – AETHER is a digital installation that plays on our relationship to the forms, sounds and colours all around us and how music evokes emotion in us. How about exploring the tragic and terrifyingly real events surrounding the atomic bombs that fell on Japan in 1945? Chisato Minamura: Scored in Silence shares the fateful days before, during and after the events and how it changed people’s lives, blending sound, animation and archive footage. Perhaps you might want to check out TOMTECH’s NoöSphere: Mindfulness in a Hyper-Connected World, which uses technology as a tool to connect with ourselves as opposed to causing mental distress. Brighton Dome and Dante or Die will host an intimate and humorous live performance within The Garden Café in St Ann’s Well Gardens that cleverly blends technology and theatre. Audience members will be given a smartphone and headset to explore the haunting concept of life after death on social media. Brighton’s Got Tech Talent will be good fun as well as teaching you about how to get in the industry. Messy Edge is the festivals in-house conference, hosted at ACCA, which will run for a day in the festival talking all things tech, from the social, cultural and political implications of it, to the issue of the lack of women in tech. There will be plenty of intelligent and eye-opening speakers; activists, artists and the thinkers, it’ll be a wonderful opportunity to learn about all areas and paths of tech, even ones you didn’t know you knew. At the core of Brighton there is a love and appreciation for the arts, and this September and October the Attenborough Centre for the Creative Arts is hosting some spectacular productions as part of Brighton Digital Festival that you won’t want to miss. ACCA supports research, teaching and community engagement through its artistic programmes including music, film, live art, theatre and dance. During the Digital Festival you can see some amazing shows that blend and showcase contemporary music, digital art and installation. The backbone of Digital Fest is their in-house conference The Messy Edge. 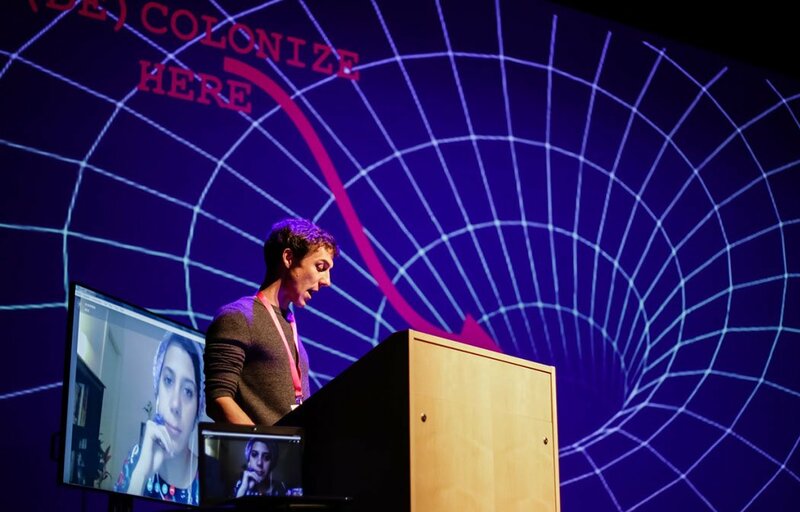 With talks by artists, activists and thinkers this conference explores the cultural and political impact of technology on our day-to-day lives and brings it to a human level to be analysed in a less clinical way. This is a conference for anyone to attend, from people with a want to unpack the state of the digital world to artists, activists, students and digital product makers. Following on from this is the Max Cooper & Architecture Social Club – AETHER live performance and light-field installation. Using electronic music, visual art and science, musical artist Max Cooper has explored how emotion is connected to forms, colours and sounds the same way music is linked to emotion. In collaboration with design collective Architecture Social Club, they created the live performance AETHER, which will stun and mesmerise as it did the half a million people who visited Lumiere London during the production’s debut. A double-bill will be taking place with performances from five-time Grammy nominated composer, electronic music pioneer and neo-classical recording artist Suzanne Ciani and experimental composer, performer and video-maker Martin Messier. Ciani being one of the most renowned female composers in the world, she has released 15 solo albums and found early success with her innovative electronic music and sound design. Whilst Martin Messier, having experimented with objects and their sounds for 15 years, has developed FIELD, a performance in which he manipulates residual and imperceptible electric signals and creates noise and light for an awe-inspiring audio-visual experience. A second double-bill is set to follow featuring London born musician GAIKA and Brighton’s own Gazelle Twin. Dancehall and industrial performer GAIKA, who released his LP ‘Basic Volume’ this summer, is a performer with a passion. Speaking up about rife political issues for those who won’t be heard such as immigration, race and anti-authoritarianism, GAIKA is bold and unafraid. Meanwhile, Gazelle Twin, stage name to Elizabeth Bernholz, is performing shortly after the release of her album ‘Pastoral’. With a flavour that is everything from industrial to art pop, it’s a promising line up. Finally, a performance from trailblazer 2000s DJ and his new-found band James Holden and The Animal Spirits. When Holden was 19 back in 1999, he became an international success with his remixes of popular songs and led the way for bedroom producers everywhere since. His latest album The Animal Spirits has seen him delivering hypnotic, ritualistic dance music to lose yourself in. TOMtech, The Old Market’s innovative tech powered arts strand, returns for its fourth year with another dynamic immersive VR season. Throughout the month, The Old Market will be transformed into the largest VR experience of its kind for any theatre across the UK. This season takes place during the Brighton Digital Festival, featuring exciting new works from some of the leading UK and international studios. This year, TOMtech will be showcasing virtual reality experiences that help illustrate the best of what truly is possible with a medium like VR. From the enchanting world of the natural world with a one-on-one digitally realised Sir David Attenborough, teaching you about how to examine remarkable specimens at the Natural History Museum’s collection to the chilling, boundary-defying Doom Room, a VR experience which tests your thoughts, feelings, and sensations. 20-30 Sept sees Doom Room enter TOMtech, an exhilarating live VR experience from Danish collective, Makropol. Explore a blindfolded guided meditation where you are transported to the afterlife. This intense experience is one that will keep you and your friends talking for weeks, but be warned: it contains scenes of an extreme nature, so it’s not for the faint hearted. (See website for trigger warnings before booking). A 10-day curated installation (20-30 Sept) VR Parlour brings you some of the finest immersive works from across the world, curated for small groups over one-hour sessions. Hold The World sees a one-to-one encounter with a digitally realised Sir David Attenborough, going behind the scenes to areas typically closed off to the public. Is Anna OK?, follows the story of twins thrown apart by one night, exploring memories through objects and both perspectives. Empire Soldiers tells the stories of the forgotten Caribbean and South Asian soldiers of World War I, following the emotions, experiences and journeys through to the present day. Come together to improve your mental wellbeing with NOÖSPHERE: Mindfulness in a Hyper-Connected World (20-23 Sept). In such a hyper-connective world, perhaps it’s possible to use technology as a tool to connect with ourselves, our emotions and hopefully regain control over ourselves. One of Brighton Digital Festival’s most popular events returns – vrLAB (4-7 Oct) combines immersive experiences and experimentations from the wonderful art, gaming, documentary and film world. If you are new to the VR world, it’s a great place to start out and experiment with loved ones. It’s not completely about VR, opening TOMtech this year, is Bring Your Own Beamer (BYOB, 14-15 Sept), bringing two nights of projector powered digital art. Now in it’s seventh year, but first at TOM, The Old Market will be transformed into a beautifully digitally creative wonderland. TOMtech LABS helps bring artists and technologists to explore and work together. This year sees the launch of TheatreXR, a technology training course designed for theatre makers to learn about and create digital immersive products, helping bring a new level of curiosity and agency to audiences. Creative Producer for TOMtech, James Turnbull says “Immersive technology offers artists a new medium with which to engage audiences.” It’s a five-day intensive course running from 3-7 September, with a showcasing of work during the vrLAB event from 4-7 October at The Old Market. FOREVER – A VIRTUAL REALITY ARTWORK BY ALEX PECKHAM – PHOENIX CENTRE – FRI 14 – MON 17 SEPT Alex Peckham returns to Brighton with his new piece of VR work, Forever. Peckham creates a world of surrealism and sing a mixture of artistic and technology mediums to explore symbolism through themes of loss, memory and nostalgia. He recreates places from his home and mixes these with imaginary and surrealist elements to construct a dreamlike world. CHISATO MINAMIMURA: SCORED IN SILENCE – ONCA – FRI 14 SEPT Chisato Minamimura’s digital live artwork Scored in Silence relays the story of the Atomic bombs dropped on Japan in 1945. This is a sobering insight into the tragedy and devastation caused as Minamimura combines footage from Hiroshima and Nagasaki with first-hand accounts from survivors. As a deaf artist, Minamimura gives a signed performance using animation, sound and vibration to create this unique artwork. COME INSIDE IT’S RAINING – THE SPIRE – THU 20 – FRI 28 SEPT This immersive artwork is inspired by the sound, the sight and the experience of rain. Set in The Spire, it simulates the experience of walking in the rain and splashing in puddles. The work creates a place where people can explore their connection to the environment and re-experience memories. Even if you’re not a technology fan, this is a innovative exploration of how we each connect with our environment. APPARITIONS – AUGMENTED REALITY: BRINGING BACK THE BYGONE & NOSTALGIA FOR LOST FUTURES – HASTINGS MUSEUM & ART GALLERY, DURBAR HALL – SAT 22 SEPT A series of digital artworks that is ‘bringing back the bygone’. Aimed to explore themes of memory, decay and change through the threat of gentrification, this series of scenes will recreate monuments from history that have been destroyed; St Leonards Pier (destroyed in WWII) and the Albert Memorial (lost to fire in 1973). The exhibition will require a smartphone. FORT PROCESS FESTIVAL – NEWHAVEN FORT – SAT 22 SEPT Explore the grounds of Fort Process while you encounter immersive installations that use sound art, music and film, located around the fort offering creative ways to interact with history, science, geography and more. There are over 50 artists and groups involved and there will be talks and workshops taking place as well.